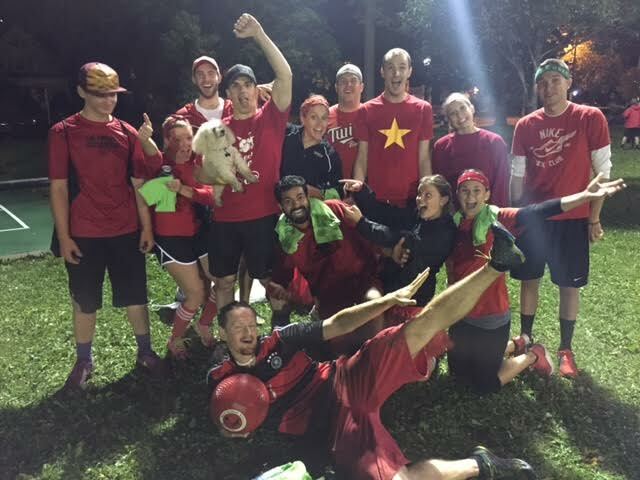 MN Twin Cities WAKA Kickball: Charity Theme Night Winners - H41 H42 Heart Throbs! Charity Theme Night Winners - H41 H42 Heart Throbs! H41 H42 Heart Throbs were quite easy to spot on Thursday night for the Aliveness Project Charity Theme, as they were all matching in full red attire! Now obviously this was completely unfair because they are the red team, so it was easy to spot them? Wait. What's that!? They are the lime green team!? Heart Throbs are new to the league this year, and took it by storm by winning in a landslide victory. They could also be seen at the bar afterward celebrating their theme success by also playing flip cup (most notably getting killed by the Uncontrollable Runs)! So congratulations to H41 H42 Heart Throbs, well done on Thursday!